Looking for a new After Effects system? At Puget Systems, one of our primary goals is to make sure that our customers end up with a fast, reliable workstation that is perfectly tailored to their unique workflow. The main way we do this is by benchmarking a wide range of hardware in After Effects (and numerous other software packages) that we then publish in our ongoing series of hardware articles. However, while this ensures we are selling the right hardware, it does not give our customers a great idea of how much faster a new workstation would be compared to their existing system. To address this issue, we are making our internal Ae benchmark available for public download so that anyone can compare their own computer to our latest After Effects hardware articles. Even better, this benchmark is compatible with both Windows and Mac-based systems! After downloading the benchmark, unzip it to a convenient location - we recommend placing it on the same drive that you store your active projects as there are a few media assets used throughout the benchmark. Next, simply open the "PugetBenchmark.aep" project file and follow the instructions shown in the "Benchmark Instructions" composition. Enable "Allow Scripts to Write Files and Access Network" in "Edit -> Preferences -> Scripts & Expressions"
Once the benchmark is completed, we recommend reverting these back to their original settings since things like Disk Cache are probably something you want to have enabled. With After Effects configured, you can run the "PugetBenchmark.jsxbin" script by going to "File -> Scripts -> Run Script File" and browsing to the benchmark folder. If you do not see this script, make sure the open dialog is not restricted to only showing ".jsx" files. You will need to confirm one prompt to clear your existing disk cache, then the benchmark will proceed. Most systems should be able to complete the benchmark in 30-60 minutes, although it will vary based on the performance of your system. When the benchmark is complete, it will give you an "Overall Score" as well as individual scores for the different types of tests. A log file is generated in the benchmark folder that includes these scores as well as the time in seconds it took to complete each individual task. You can compare your scores to those in our After Effects hardware articles dated from December 2018 and newer. 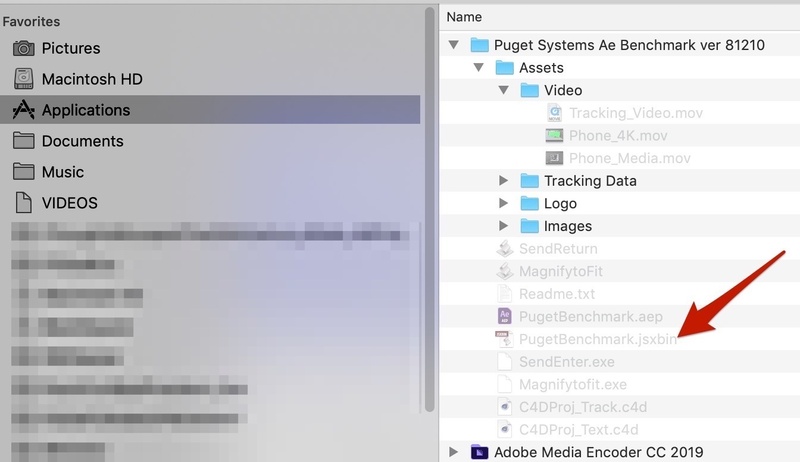 If you are on a Mac using Mojave, you should manually run the "MagnifytoFit.app" and "SendReturn.app" files prior to running the benchmark. Due to new security features in Mojave, these files will give an error and break the benchmark if they do not have permission to send commands to System Events. If you run them manually and click OK, you can enable permission in "Privacy and Security -> Accessibility". We have a video available showing this process that you can follow. 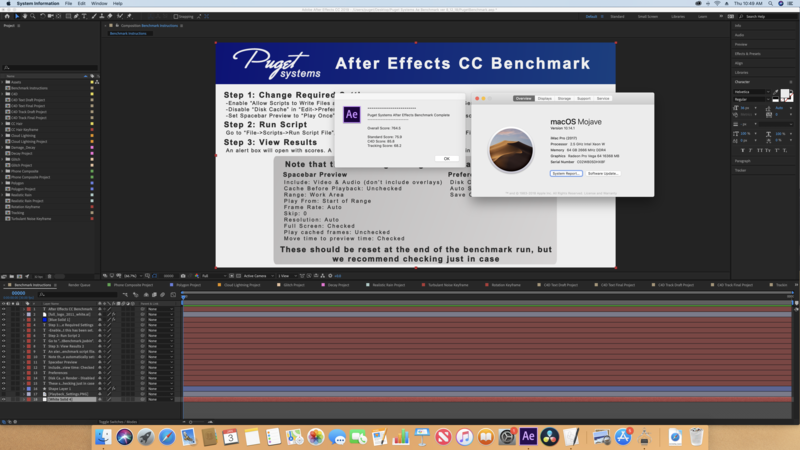 This benchmark is designed for After Effects 2019 and should run on virtually any Windows or Mac-based system that has After Effects CC 2019 installed. However, due to the size of the test projects it is ideal to have 16GB or more of system RAM and a GPU with 4GB+ of VRAM. Note that this benchmark is still in BETA. Plug-ins and customized preferences in particular may prevent the benchmark from running properly. If you run into any issues, we recommend resetting your preferences to default - be sure to make a backup first! Our benchmark tests RAM Preview FPS (in both half and full resolution), FPS when rendering a composition out to a file, and performance when doing a warp stabilize and 3D camera tracker analysis. Advanced Electric FX Tutorial! 100% After Effects! Realistic Rain Drop FX Tutorial! 100% After Effects! Colorful Glitch FX Tutorial! 100% After Effects! Advanced Damage & Decay FX Tutorial! 100% After Effects! The Tracking Score is the average of the scores for warp stabilize and 3D camera tracker tests. The C4D Score includes the average of RAM Preview (half and full res) and Final Render results for the compositions that utilize the Cinema 4D 3D renderer. Likewise, the Standard Score is the average of the RAM Preview (half and full res) and Final Render results for the compositions that do not use the C4D renderer. Reordered the tests to Render->Half Res Preview->Full Res Preview in order to try to resolve issues with some systems improperly using the disc cache files for the render test which resulted in too high of scores. Added additional checks during the Render tests so that if the benchmark is not able to start the render automatically, it will prompt the user to click the "Render" button manually. Added more robust detection for when the benchmark starts/stops RAM Preview and Render testing. This is to fix a bug on some systems where if the test doesn't start within a few seconds, the benchmark thinks it already finished. Added Ae version check to make sure Ae 2019 (ver 16.x) is being used. Initial benchmark errors (Disk Cache not disabled, Ae not using English, Ae version mismatch, etc) now allow for you to continue the benchmark anyways - although the benchmark will probably break so that isn't recommended. Hi! thanks a lot for this! But, I tried to set preview to loop once, but the script still wont start and says I need to set preview to "loop once". Despite having restarted AE and even rebooted the machine and previews actually only playing once when testing. Any ideas? Huh, interesting. Are you on Mac or PC? And you sure you are setting it for spacebar and not any of the other preview hot keys? That setting is a little bit weird in the setting files, so I'm worried there might be something weird with it. I'll take a look at it later to see if there is something I missed and worst case I'll swap it over to a warning rather than a hard error that stops the benchmark from being run. Yea, looks like a bug then. I can't check it right now (and unfortunately I might not be able to tomorrow either), but when I can I'll check it and release an update. My guess is just that the script isn't finding that one setting since I actually have to do a file text search to get it and there is probably some weirdness going on. Thanks for pointing out the bug! Thank you - looking forward to test :) I was just curious as to how my threadripper 1950x performed - which I expect is quite low - as I noticed the slower responsiveness of the entire program after getting this CPU. Though based on your charts, even the 2950x scores pretty bad compared to Intel CPUs - proving that AMD threadripper series is a pretty bad investment for any AE users. I couldn't find anything wrong, the only other thing I can think of is that if you aren't use Ae 2019 (ver 16.x) it wouldn't be able to detect that you changed that setting since the setting file wouldn't exist. I just added a Ae version check to the script, but also made it so those errors are more of a warning. You can have it run the benchmark anyway, but it just means that it might break at some point or get stuck. So re-download it and give it a try. thanks will test it. I use the very latest version of CC 2019 AE. Anyway, results for my 1950x was rather bad, as anticipated, but it was good to see that the experience I have had with the CPU made sense according to the test. Almost as bad as Mac Pro, So awful results both in standard and C4D scenes, which you guys have stated before. TR4 is by no means a good overall CPU for creators, except only those who need many cores for rendering for a cheap buck. Hi, I wanted to ask permission to use the results of their benchmarks on my Spanish-language YouTube channel since I plan to make a video about the workstation. Since it is not true that always more nucleos is the best choice and the choice of components should be based on the determined task that they are going to execute. Obviously I will put in the description that the data was extracted and analyzed from pugetsystem and I will leave the link to the site. Sure! 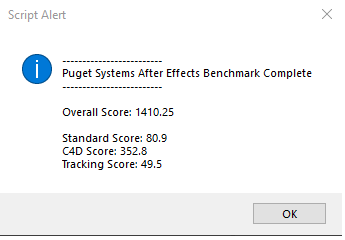 We would appreciate having some reference to "Puget System's After Effects CC Benchmark" (or something along those lines) on the graphic itself in addition to a link in the description, but absolutely you can use results from our benchmark. 16.1 moved the preferences file a bit. I'm working on an update right now that should fix it and keep it from happening in the future. Just have to run the benchmark on a couple of systems here to make sure I didn't break anything else, then I will upload it. Should be up before 3pm today (assuming it is working right). Thanks Matt! All working fine and I already know that I have "trash" :D ...probably I'll buy a new PC. Thanks for this!! it's really helpful :) Something that would make this more awesome IMHO is to include in the downloads the benchLog csv of scoring machine, in order to be able to compare in detail each one of the tests with the base config that sets the benchmark score. I for one, would love to see how many fps the base machine got in the polygon test RAM preview in order to compare to mine. In the polygon test I got: RAM Preview (Half Res. ),Polygon Project,11.1,FPS. The main reason we didn't get too much into the reference scores is because that score is not going to change over time. So as there are driver updates, Windows updates, Ae updates, etc. the actual performance of a system with a i9 9900K is going to change more and more from the reference score. What I would do is to compare your results to those in out hardware articles. 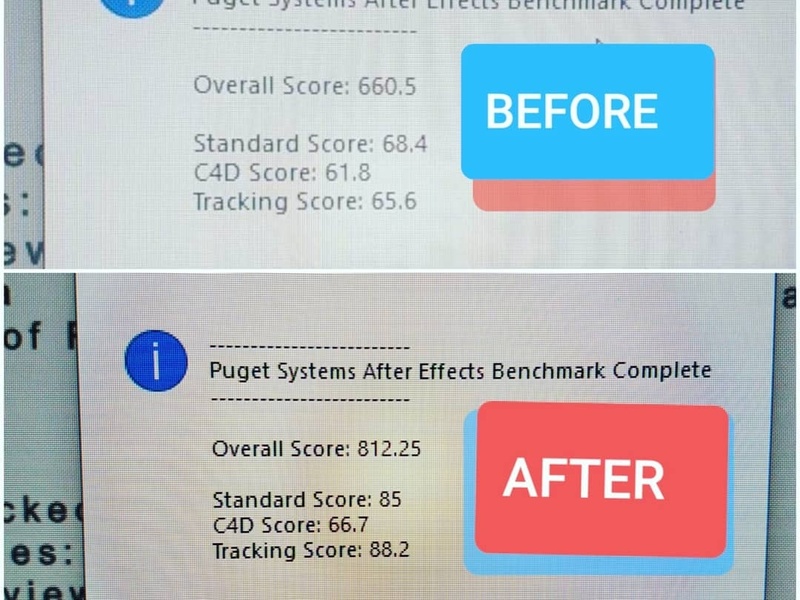 https://www.pugetsystems.co... right now is the only article using this exact benchmark, but it includes results for CPUs like the i9 9900K. Thanks for this tool! But I'm confused by the results on our systems. Our benchmarks are way above the "top" score. Most of our systems are showing an overall score of 6100 or more. Other metrics are equally out of range (Standard score: 798, C4D: 804, etc). Any idea what I'm missing here? Huh, that is interesting. Could you grab the log file (labeled BenchLog_XXXXXX.csv in the benchmark script folder) and toss it to me in an email at labs@pugetsystems.com ? Those scores look like they are just multiplied by 10, but I can't think of how that could be possible. The other thing it could be is that either the disk cache isn't being cleared (if you have run the benchmark multiple times) or the viewport resolution isn't getting properly set to half/full. Seeing the log file will let me determine if it is a score calculation issue or something wrong with the actual run. Edit: Actually, include the StatusLog_____.txt file as well if you can. Hey Craig, I just sent you an email, but for anyone else who had this issue it should be fixed in the 18.12.17 version I just uploaded. I think the issue was that on some systems, it takes longer to start the render than I expected. That means that sometimes the benchmark would think that the render was done before it actually even started. I added some extra code to help make sure that doesn't happen so hopefully it should work for you now! Hello, I have the same problem here and downloaded the script on friday, so it should be up to date. My overall score is 19900... So what can I do to be sure of the result ? And moreover, how can I interpret these results (just : ok it's a good machine, or is it more precise...?) ? I also had to click "render" for every final render, is that normal ? Most of the time, abnormally high scores are caused by either that or disk cache not being disabled. So try making sure that is disabled before running the benchmark, and make sure you let the After Effects window stay in the foreground. If you are doing other things on the system at the same time, it may not be able to run properly. I didn’t add the scripts to accessibility but I launched them before to be sure they passed security issues. And disk caches were empty. Actually, this is a new machine, that’s why I make some tests. By the way, as for the results : the higher the better or the lower the better ? You need to check them in Accessibility. Running them once adds them to that list, but doesn't actually enable them to allow other applications to run them. Higher results are better, but it should be almost impossible to get an overall score above 1000. Something like 19900 means that it wasn't actually doing some of the tests, just immediately failing and counting something that should have taken 60 seconds (or whatever) as having been completed in 1 second. 12:59:51 - Waiting for Final Render"
And then I have to click manually on render. ok, I redid it and tried to click on render as fast as possible to simulate an automatic click on the render button, and I got a score of 39000... Something went wrong again I guess :/. Hello, same problem here on a MacPro 5.1 running latest high sierra with a SSD. I has to run the scripts manually since they didn't start, even using Accessibilty like in your video. I'm working on an update right now that should fix that, or at least make it smart enough to know when the renders aren't starting and ask you do do some manual input. It will still technically result in a tiny bit lower score than if it worked automatically (since it takes a real person a split second to click on buttons), but I don't think it will skew the results more than a fraction. I just have to run the benchmark on a couple of systems here to make sure I didn't break anything else, then I will upload it. Should be up before 3pm today (assuming it is working right). This page was very helpful in trying to understand these issues –– https://www.pugetsystems.co... –– *I'm only interested in Standard Render speeds btw*, for what I do. I can return the card if nec. But am wary of NVIDIA in Macs, due to potential hassles and learning curves, and also cost is a factor. Have re-started AE btw. Also, the Activity Monitor/GPU History window shows the rendering is being done by the Radeon card. First, thanks for the help so far … am trying to diagnose why my new Radeon RX580 makes no difference in AE rendering time (in 'Mercury GPU Acceleration - Metal' or '...OpenGL', versus '...Software Only'). Was about to run the Puget Sound Benchmark but the last step has 'PugetBenchmark.jsxbin' grayed-out (see attachment). Are you sure you are trying to run a script and not trying to open a project in Ae? That is the only reason I can think of why that would be grayed out like that. "File > Scripts > Run Script File". If that isn't it, I don't know what else it could be. I would try resetting your preferences and if necessary, uninstall and reinstall After Effects. After that, you should contact Adobe support since not being able to run a script indicates that there is something wrong with either your system or After Effects. Unfortunately, I'm traveling until Boxing Day, and so I'm away from my EGPU+. I'll run the rest of my tests after I'm back, and will be in touch again after that. 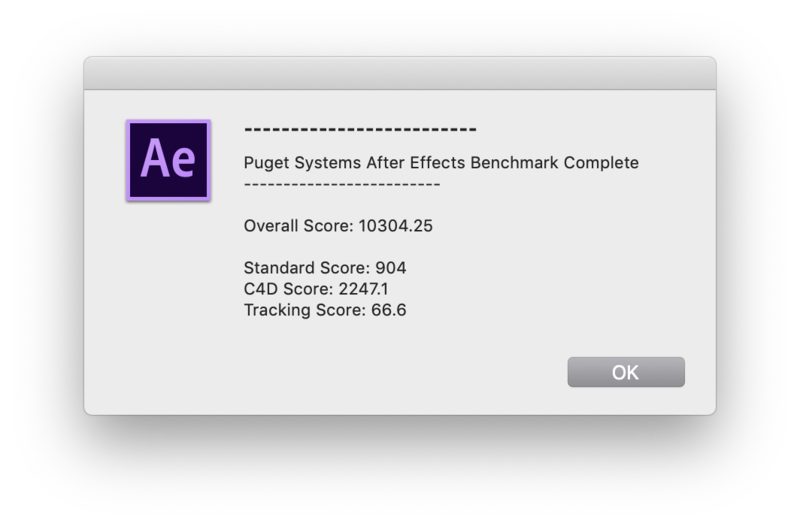 Hi trying to set up this benchmark and I get a popup immediately on running script that says Puget Systems After Effects Benchmark Complete Overall Score infinity Standard Score infinity C4D Score infinity Tracking Score 0. Clearly it's not running what should I check for? Oops, that was my mistake when I did the last update. There is a new version that should fix that issue. Sorry about that! Thanks Matt that did it! tried the test on the latest version of AE and it just kept looping through the test even though loop playback was off in the Ram Preview UI. Restarted several times with the same result. It did however write out a log and it looks like one time through the test took about 12 minutes. Wondering how that stacks up. You sure loop is disabled for spacebar preview specifically? If it is, does it continue to loop anyways of you open a comp and manually hit spacebar? Only other thing I can think of is that somehow your "default" playback method is set to something besides spacebar, but I don't know how that could be done. I would try resetting your preferences to default if you still can't get it to work right. This is very nice! Thank you for sharing yours develop & research softwares with us! Will be very cool if in future there will be a Premiere version of this Benchmark. Thanks again for your work ppl! My old 4930K @4.4ghz scored 539pts! We have an internal benchmark for Premiere Pro, but it is likely going to be a while before we can make it public. Premiere doesn't have nearly the scripting capability that Ae or Ps have which means we have to use external utilities pretty much exclusively. That is completely fine for us, but it makes it finicky if you don't have the same screen resolution, DPI, workspace, etc. that it is designed for. Are you using the latest benchmark version (18.12.18)? There was a bug in earlier versions that caused that problem, but it should have been fixed in the latest. We typically see a variance of 3-5% between runs, but I don't think seeing a bit more than that across multiple machines would be too unusual. Especially since different systems might have difference applications running in the background, slightly different software configurations, etc., that can all affect benchmark performance. I did this just for fun on my Lenovo Legion laptop that I got about 1.5 years ago. i7-7700HQ 2.8GHz, 16Gb ram. Took more than an hour to run it. Results aren't too bad compared to the reference system considerinng the hardware differences. Thanks for making this available. My system is very similar to your base system. i9-9900k, 64gb RAM, Crucial 1TB SSD, Windows 10, but with an RTX 2080Ti. My scores were: Overall 896.5, Standard 95.9, C4D 95.1, Tracking 71.7. With our systems being so similar, and having the upgraded GPU, is there any way to narrow down why my scores weren't closer to the base, or even higher? There is a lot that could be lowering your scores, ranging from the version of Windows you are on, driver/BIOS version, what motherboard you are using (some are more or less aggressive on Turbo settings), CPU cooling, and what applications you have running in the background. Things like antivirus can be especially bad depending on what software you are using. I have the same problem. No popup but I do get a log file. 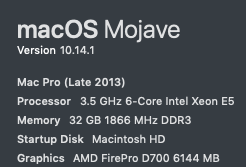 Also running Mojave and AE 16.0.1. The render times are mentioned in the log file and each project is 100 frames long, so you can calculate the framerates manually if you can't wait till this has been fixed. You mind emailing the BenchLog_XXXXXX.csv and StatusLog_XXXXXX.txt files that are in the benchmark folder to labs@pugetsystems.com ? I haven't been able to replicate the issue on our Macs here, but that might give me enough information to figure out the issue. Thanks! I have the same issue, run the test but no pop up. I am using After Effects v16.0.1 (Build 48) on a Windows 10 64bit PC. Does this mean there was no result to the last benchmark, which would probably be the reason I did not get a pop up? Interesting. Good to see it happens regardless of the OS. One thing I'm wondering - are you leaving the system completely alone while it is running the benchmark, or are you doing other things at the same time? Browsing the web, etc. Basically, does the After Effects window always in focus? Is the render button showing, or had the render started? And again to confirm, the AE window has focus and you are not doing anything else on the system while the benchmark is running? Is there any news on this? Would love to test my machines. On both my Macs they stop at the final renders. AE window has focus and I'm not doing anything else. Followed all the instructions including the Mojave security settings. Since I ran the benchmark my after effects still goes fullscreen when I press play. How do I stop this? I've re-installed after effects which didn't solve. That is one of the settings that is auto-set in order for the benchmark to work properly. It should have been reverted back to your original settings, but sometimes it doesn't for some unknown reason. You can change it in the Preview settings for Spacebar (or whatever key you use). Note that there are a bunch of other settings that are changed that you might want to doublecheck as well. They are all listed on the main "Benchmark Instructions" composition. Re-enabling disk cache and auto save are the two biggest ones I would confirm. I have an overall Score of 706, where can I see the score with your machines? Is it possible to have better results with settings in after effects? Right now, we have our results in our Ae hardware articles: https://www.pugetsystems.co...=After%20Effects . We only have one article at the moment using this benchmark, however: https://www.pugetsystems.co... . Eventually we are planning on having some sort of public benchmark result viewer (maybe even allowing public uploads of results), but we have a long backlog of programming projects we need to get through before we can tackle that. so.... after the benchmark crashed, I decided to continue to work I was inititially doing. But now for every ram preview I make, the magnifitofit thingy is doing his work. Very annoying. How do I fix this? The benchmark might still be running in the background (it shouldn't be, but programs crashing can be weird) . I would just do a quick reboot. Please assist. I'm on a Mac btw. Thanks! That is weird, pretty sure that is a built-in command . You have any extensions or plug-ins installed? If so, you could try uninstalling them or resetting Ae back to default preferences (back them up first if you have anything set that you want to keep). I do have extensions installed. I'll take a stab at both suggestions and see if either of them fix the issue. Thanks! Any solutions to this? I've had the same issue with some aescripts scripts in the past. I don't know if there's some sort of environment variable not set or what. Yeah, I know. It doesn't make sense, especially when other scripts that use it are fine but I believe they all use their own sandboxed JS, sort of. Although there are collisions possible if you don't wrap your code, so I don't know. Anyway, I got it to run after a restart. I ran into some odd video card issues, but I've been having them for a little bit on my Hackintosh. It's run strong since the end of 2013, but it's time for something new. Anyway, thanks for the help! I've tried running the script twice. Both times I get to the "cloud lightning project.mov" render, and it just stops. In status it says "Failed at 00000". 25.33GB available on the drive, so it isn't running out of space. Any ideas? Thanks. 25GB isn't a lot of free space. After Effects might require a certain amount of space in order to start the render. I would try to free up more space (at least 50GB if you can) and see if that solves the issue. 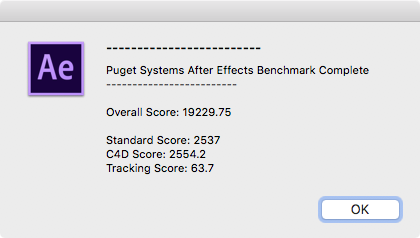 But my MacPro 2013 kills the benchmark system x 200! Ha, that's odd. Looks like it didn't actually run the RAM Preview tests. Mind tossing the statuslog_.txt and benchlog_.csv files in an email to mattbach@pugetsystems.com ? I'm guessing it is a setting in your preferences that prevented the benchmark from running properly, but is may be able to figure out a check by reviewing those files. Thanks for the log files! It looks like the render tests didn't properly run, so the benchmark thinks it was rendering at a couple thousand FPS. I've seen this a few other times, but haven't been able to figure out exactly why it happens. I have a few ideas to add to the next update that might help, however, or at least have it result in an error rather than a bogus score. Thanks again for the help! Hi! I did a series of tests using this amazing benchmark, I mainly found out the performance gains from RAM frequency and dual channel, but the amount of RAM does not affect performance. In addition, in some cases of 8G RAM, the RAM preview test data is abnormal. This benchmark seems to be 100 frames of comps. I hope to enhance the detection of RAM preview error and additional provide different time lengths comps for different amount of RAM to do stress test. Because there tests have been showing that the amount of RAM will affect the rendering time, I hope to confirm. Sorry for my bad English, thank you! In After Effects, more RAM doesn't really improve how fast AE is able to render each individual frame. What it does allow you to do, however, is to store more frames in RAM Preview. For example, if you have a comp that is 1000 frames long, but you only have enough RAM to store 500 frames, by the time you play through the entire comp and start over from the beginning, the frames at the start have already been bumped out of RAM Preview. In that case, you have to completely re-render those frames from scratch rather than just pulling the already rendered frame from RAM. If you have enough RAM to store all the frames, however, Ae doesn't have to keep re-rendering those frames. This is why there really isn't an answer to "how much RAM do I need for Ae". It really is... as much as possible. It doesn't make Ae render any faster, but it lessens the chances that Ae has to re-render frames that it otherwise could have simply pulled from RAM. Cool, this also be my conclusion, the amount of RAM will only affect the preview time length. Actually it will be less than the theoretical value but it won't be worse, and the preview time length is usually the same. For example, the same test 32G RAM always stops at 1min 50secs (about 3300 frames) on different computers. I haven't seen that error come up before, so it may not be the benchmark but your install of Ae. Can you manually apply a 3D Camera Tracker on any footage, or does it break? If it breaks, you might want to reinstall Ae to see if that fixes it. Applying it to footage works fine. The issue happens all the time on OSX 10.12.6. This breaks tracker scores which results in 50% less score. Running benchmark on OSX 10.13.6 tracker works fine and results are almost the same as on Windows. Your friend's score is definitely low for some reason. 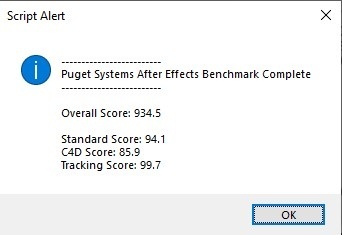 In our testing, the 9800X should get around 78 for the C4D score and an overall score of about 800 https://www.pugetsystems.co... . I'm guessing he has some program-wide setting that has been changed that the benchmark can't account for. I think your scores are pretty accurate. I haven't tested a 6700K with this benchmark myself, but it lines up with what I would expect. Thanks Matt. We'll see if we can track down what's holding his machine back. Yes, if you have to click the render button by hand, it will skew the results a bit. I've got an update in the works that will add a bit more robustness to that portion of the benchmark though. It won't fix the issue (since the root cause isn't something I can control), but it will at least throw a warning that it couldn't click automatically and ask you to hit the button. Will have a bit more logic built in as well so hitting it manually won't affect the results anymore. Dear Matt and team at Puget Systems, this assessment tool is very helpful. The test has a small hickup on my end. I’m on MacOS 10.13.6 and in the midst of the test I had to manually hit the Render Button for the Glitch Composition to make it continue. After that everything worked as expected. I used the latest version of the benchmark test from your website. If it just didn't work once, most likely Ae wasn't the active window at that time. If you use the system while the benchmark is running, it can prevent it from starting some tests. Thanks Matt, that was probably the case. I remember doing something in Finder. Hey Matt, i just saw the School Of Motion youtube video about After Effects machine, I live in Pakistan and unfortunately i can't purchase a custom PC from you guys as you don't ship internationally, Well currently i'm using Intel i7 8700k 4.0 ghz (unlocked) with 32 gb of 2000mhz crosshire rams, gtx 1060 6gb graphics card and 2 ssds and 2 standard hard drives. I did the After effects bench mark test from the given project file on your website, During the test i got 'Hardware Display Acceleration' error but still i was able to complete the benchmarks and my total score is 660.5 which i think it's average. I'm upgrading to 64 gb of rams and getting Rtx 2080 8gb also upgrading to 1 TB of SSD to move all of my assets to SSD from my standard drive. For the i9 processor it's a bit out of budget for me. My Question is that, will this new Add-on's will improve the overall performance in After Effects? After Effects is really CPU limited most of the time, so the RTX 2080 may add a bit of performance, but probably not very much to be honest. Moving your assets to an SSD definitely will help though. It likely won't show up in the benchmark, however, since it will mostly improve performance for things like importing media and opening projects. How much it helps will probably depend on the type of files you work with. Generally, a lot of smaller files will benefit more from an SSD than a few large files - although that depends a lot on what the random and sequential read/write performance of your current drive. Thanks for the quick reply, I have one more question. I'm a vfx artist so i mostly use 3d Tracking, mocha pro AE, Elements 3D + C4D, Trapcode Particular, Keylight plugin.. tools for creating VFX work mostly. Ah, yea, once you get into plugins things change completely. Right now, we don't do much performance testing with different plugins since that is just a giant rabbit hole that we could get sucked into. So I can't really tell you exactly how much a RTX 2080 would help, but like you said, some of those are GPU intensive so I would imagine it would help quite a bit. That could be caused by a lot of different things. Could be OS related, or you could have a bad GPU/RAM/motherboard. Figuring it out exactly is likely going to require in-depth troubleshooting to be honest. On the other hand, if the system is working fine for your everyday work, it may not be a big deal. A bit concerning, however. 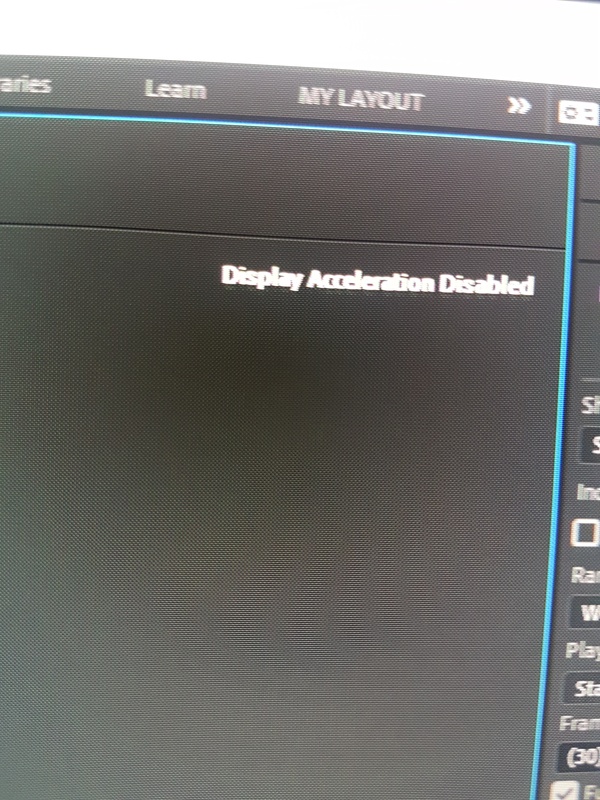 I use my system for daily with heavy projects in after effects, i don't get this error mostly, i'm guessing it's a GPU failure for sure, because Display Acceleration is related to GPU acceleration in after effects for sure, i have everything brand new with under warranty in my system expect for my graphic card which is 2-3 years old. All was going well until the final render. It failed! All that time waisted. I had several pop ups throughout asking for me to allow or open something. I always chose to open it. Any reason why it failed? "If you are on a Mac using Mojave, you need to manually run the "MagnifytoFit.app" and "SendReturn.app" files prior to running the benchmark. Due to new security features in Mojave, these files will give an error and break the benchmark if they do not have permission to send commands to System Events. If you run them manually and click OK, you can enable permission in "Privacy and Security -> Accessibility". We have a video available showing this process that you can follow." Thanks Matt. I missed that! We are on Sierra due to our current servers, so I was able to set up everything with accessibility but we don't have the automation module in sierra. Hopefully it will work and I will try again. Thanks for the fast response. Looks like it still fails during the final rendering portion. I'm guessing Sierra OS is not supported for this? Sierra should work, but to be honest we didn't do a huge amount of testing with that version. All the security stuff in Mojave was in the front of our minds when working on the Mac version. I'll write down a note to check on that as we work on the next revision. Matt Bach looks like a full time job for you right now just responding to this thread! One more query for the pile, doing this on a few machines. One is getting an error on the first comp that it cannot find the specific file. All assets are there and no problem with another machine. I cant find what the file in question is, no missing assets. If i click ok again it comes up again when it gets to the Electric comp. If i just ok through these errors will the results still be accurate? It won't be 100% accurate since it is missing a file, but hard to know how far off it will be. Really strange that it is saying something it can't find something, especially since it isn't saying anything is missing. Seems like a bit of mixed messages going on there. Hey this is amazing! Thank you so much for putting this together. If I could offer one suggestion- try putting a test counter in each comp (eg. 1/16, 2/16, 3/16...etc) to give the user an idea of how far through the tests they are. I actually failed the benchmark a few times because I thought it was just stuck in a loop and didn't know how far in to the set I was. Many of the comps look very similar so it's tough to tell where you are. Otherwise, great work! The community has needed this for a long time! That's a good idea. I can't put a counter in the UI without making the benchmark a full-blown extension, but I could probably add a text overlay on each comp that has that info. Technically it will lower performance a hair, but it would be minor and consistent so I don't think it would matter much. oh yeah that's exactly what I was thinking- just a single text layer in each comp so you have an idea of the order. Or heck even in the comp name! Hey Matt Bach i wanted to update about about my benchmark, i finally upgraded my rams uptp 64 gb, bought RTX 2080, Moved all my data to 1 TB SSD and 256 gb m.2 as cache drive, just need to upgrade my processor, but i got amazing results for now and my after effects is faster now. Thank you so much for over all guidance. Interesting that the higher clock speed on the Retina 5k resulted in lower scores than the 2.3GHz Xeon. where it says higher clock speed is more important. Must be an architectural difference? Usually, that kind of score means you didn't disable the disk cache. Make sure that is off, and try running it again. Hi, how do I get the result? The test was running, but i didn't got any result. If it never gave a result window, then it must not have completed. I know a lot of people with Macs get stuck on the Render tests (due to MacOS security settings I believe). You can check the "StatusLog_XXXXXX.txt" file in the benchmark folder to see what the last task that was run. this are the last lines. would this be the last action? edit: I answered it myself it's not the last action and the renderd Glitch file also is missing. Yea, it probably isn't starting that render. 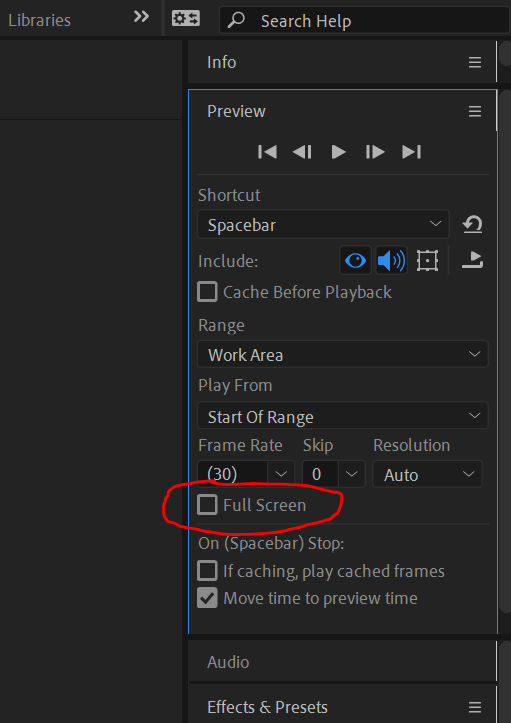 Are you making sure to keep After Effects as the active window? If you click off of it and start using another program, the benchmark might not be able to start the render tests. We have to use an outside program to click the render button since there is no way to script the start of a render without it freezing the entire program for the duration of the render. i saw in one youtube video that you recommended them to use the normal SSD-> OS and Programs, NVME ->Scratch Media Cache. On your site, when selecting the premiere pro 4k workstation, on "third hard drive" there is no option to pick NVME, only first and second harddrive, so i assume you want me to use those 2 NVMEs for os,applications, footage....and normal SSD for scratch etc? Quick question, I know caching is disabled, but did you run the AE benchmark off of the M2 SSD? I am assembling a similar build, but want to know where to run the benchmark from. Our reference score is off a 960 Pro NVMe M.2 drive, but it shouldn't affect performance at all. If you go down to a platter drive the render tests may be a hair slower, but anything SSD-level and above should give nearly identical scores. Thanks Matt and Puget Systems for this awesome test. I can confirm that the performance increase from more threads on the i9-9900K is very limited. Real cores with high clock speeds seems to be better than virtual threads it self. Keep up the good work. I had fun with the benchmark. I have recently updated my system to one very close to yours. I'm using the i9 9900k with the Gigabyte Z390, SSD etc. I'm also cooling my CPU with a coolermaster ML240. I had a local company assemble for me. My question is about CPU temps with regards to heavy renders inside AE. I am peaking at low 80s (C) at times while it's probably averaging lower to upper 70s rendering heavy comps. Idle is somewhere in the mid 30's to 40. The freq tops around 4.8ghz so it's using the turbo on CPU. Does that sound right for heavy AE renders and what temps have you noticed with rendering inside AE and the 9900k? BTW thanks to your sites advice, my best bench score came out to 855 which I'm very happy with considering it was 490 before the upgrade. 80C is a perfectly fine temperature. Intel CPUs don't start throttling until 99C, and we typically don't worry too much until the CPU starts to get over 90C in sustained, heavy loads. An AE render isn't actually all that high of a load (unless you are using some sort of batch render like RenderGarden), but keep in mind that the CPU temperature is only half the equation - CPU fan speed is the other half. CPU fans ramp up/down depending on the temperature, and most motherboards by default don't really ramp up the fan speed until around 75-80C. So most of the time, 80C is what you will get under any significant load, but the temperature shouldn't go up much beyond that since the fans will ramp up to compensate. So really, if you are worried about long-term cooling and making sure the system will be fine even once it gets a fine layer of dust inside it is to check out the CPU fan speed and make sure there is a decent amount of headroom there. Thanks for the response! The AE scene I'm rendering is pretty heavy with effects, lens blurs, high res images and textures so it def pushes the CPU. The fans will ramp up pretty high and then go down. (Assuming it's preparing the next frame to render) Then it goes up again. I can hear the fans really well. It's kind of a cycle on each frame with an up and down on the fans. I'm assuming that's normal? I think the highest it's ever peaked was maybe 83C, but just watching the temps live, it's bouncing up and down from anywhere between 50-80 rendering. Yep, fans ramping is normal and good. Awesome, well thanks again for the help! I am having the same problem ComputahNerd had 4 months ago. I just built a machine with basically the same specs your recommended build had, and I am running after effects 16.1. I have tried unintalling after effects, tried resetting preferences as your website recommends, even tried running the test with the loop issue, but it just looped endlessly until I manually ended it. Is there something I am missing? To me that seems quite low for the system i have, but i could be wrong? Now i know my system isn't quite top of the range but I'd at least expect it to beat a 2018 High Spec Macbook pro that got 760 overall. Does this suggest something is wrong with my system? Or is that actually quite a reasonable result for the above? Any suggestions on what else i should upgrade? I want to be pushing at least close to 800 overall. I'm either off to buy more parts or taking it to get repaired. Any input is more than welcome. Thanks in advanced. That score is pretty much what I would expect - maybe a hair low but that could just be due to background applications/tasks that are running. A Ryzen 2700X with a 2080 Ti scores about 730 points ( https://www.pugetsystems.co... ), so 6% lower than that feels right. Unfortunately, AMD simply isn't great for Ae since it relies so heavily on single-threaded performance which is where Intel is stronger than AMD. If you want to hit 800 points with hardware that is currently available, you are pretty much going to need to go with Intel unless you get into heavy overclocking with Threadripper. Nope, something must not have been set right. Most likely, the disc cache wasn't disabled so the export t tests are using cached frames rather than generating new ones from scratch.